Christmas in Branson is a great time to celebrate the season where you can truly feel the spirit of Christmas as you see thousands of beautiful lights through Branson’s Gift of Light. As new drive-thru Christmas light display in the area, “Branson’s Gift of Lights” uses super bright, all-LED lights. With great features of brand new light displays, this will remind you that there’s no other place celebrates Christmas like Branson. Come celebrate Christmas in Branson by hearing the story of the birth of Christ which is set to synchronized lights. Watch out for the whimsical prehistoric holidays and a forest of Christmas trees. Located off Shepherd of the Hills Expressway, Branson’s Gift of Lights drive-thru is in the same place where the former Festival of Lights was located there for almost 25 years before ending its run last season. Branson’s Gift of Lights is operated by Attraction Management Group. This Christmas lights drive-thru features more than 300 light displays with over one million twinkling LED lights through the 1.2 mile drive. 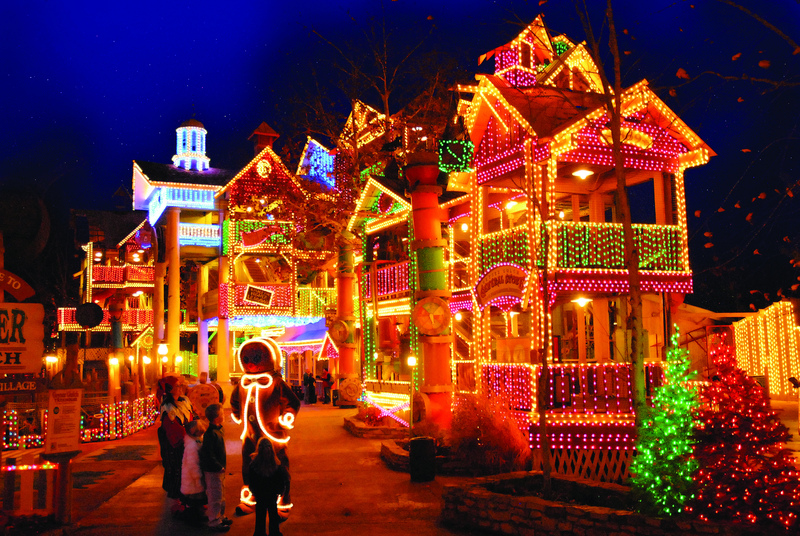 This great display of Christmas lights in Branson is designed and assembled by Indianapolis-based Winterland, Inc.
Branson’s Gift of Lights is one of the most extraordinary and beautiful Christmas light displays in the country. This great Christmas display in Branson has been recognized as one of the best in the country and made even better this season with super-bright, LED lights. A breathtaking display of Christmas spirit, Branson’s Gift of Lights is a unique attraction of the holiday season in Branson. As one of the most popular attractions in Branson during the months of November and December, this great display of Christmas lights will create memories that you will cherish forever. Branson’s Gift of Lights offers a drive-thru Christmas Light Tour. This is a self-guided driving tour which provides an amazing way to see holiday spirit that lives within the hills of the Ozarks. With over a mile long, this Christmas light display which is set in a beautiful valley in the heart of Branson is sure to be one of your most memorable holiday experiences in the area. With the capability to accommodate a variety of different vehicles from compact to motorcoaches, the ride-through Christmas display operates on general admission that require no reservations. As one of the largest light displays of its kind in the Midwest, your tour takes you on a 1.2 mile route that traverses the hills of the Ozarks. During the tour, you can have the chance to see a variety of different lit up displays – from the simple ones you will be seeing up to the most state-of-the-art electronic shows to be found anywhere in the country. Thousands of dazzling Christmas lights featuring 12 Days of Christmas, a beautiful Nativity scene, and the popular Christmas Tree Forest, are favorites among visitors. So, if you want to celebrate Christmas in Branson, take a self-guided driving tour at Branson’s Gift of Lights and see for yourself great display of thousands of beautiful lights.